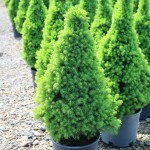 A dense, slow growing, pyramidal to conical evergreen shrub. The new growth is soft, bright green. Prefers moist, well-drained soils and full sun. It benefits from a location with good air flow. 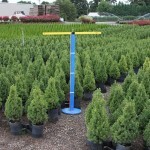 Use in the landscape as a specimen, focal point, or for foundation planting. Discovered in Alberta, Canada in 1904.